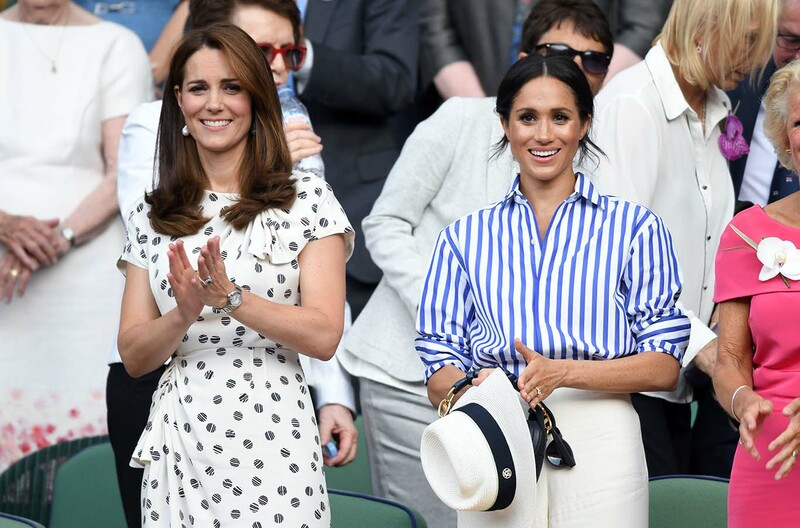 We are a nation gripped with princess fever: the outfits and hairstyles of both Kate Middleton and Meghan Markle regularly appear on the front pages of our national newspapers. The desire to assess and emulate their style is almost universal. This is particularly true amongst wearers of wigs for women: Kate Middleton and Meghan Markle style wigs are hugely popular trends right now. Both women sport long, glossy brunette hair and they both travel with their personal hairdressers. But it is here that the similarities end. Here we break down both of the Duchesses most popular hairstyles and how you can pull them off. Whose style do you prefer? Are you a fan of Meghan Markle’s low essential messy bun, or Kate Middleton’s bouncy blow-dry? Unlike Meghan Markle, the Duchess of Cambridge very rarely wears her hair up. Instead, she prefers to wear her brunette locks flowing down around her face in high maintenance blow dried waves. This look can be achieved yourself at home, but it is a high maintenance look: you will need to boost your roots using barrel rollers, and then use curling tongs to create rich and luxurious waves through the length of your hair. You could also choose a pre-curled ladies wig if you want to achieve the Kate Middleton look without having to get up early to curl your hair every morning! Work a little wax through your roots to hold them in place and then apply a gloss spray through the length of your hair to achieve Kate Middleton’s trademark high shine look. The glossier and healthier your hair can look the better. Interested to know why Kate Middleton so rarely wears her hair pulled away from her face? This is because the Duchess of Cambridge has a very distinctive scar related to a childhood operation, according to a press release from Kensington Palace. This scar is only visible when Kate pulls her hair away from her face and so, like many people, she chooses to wear her hair down and keep it covered. When Kate does choose to wear her hair up, for formal state occasions, for example, she opts for a sleek and luxurious feel. Her hair is usually pulled back into a neat chignon and not a hair is left out of place, topped of course with a Royally beautiful crown. Whilst we can’t wear crowns without looking like we’re heading to a costume party, if you want to recreate this look for your own special occasion then a diamante hair slide or on-trend bow would have the same impact. Meghan Markle tends to be more versatile with her hair then her famous sister-in-law. She wears her hair both down around her shoulders and up in her trademark messy bun almost equally. Meghan chooses to chemically straighten her natural afro hair, preferring to wear it in loose waves: wigs in this style are also incredibly popular. During her most recent royal tour, she chose to wear her hair poker straight for a formal banquet dinner in Australia, but critics almost universally agreed that her curled style is much more flattering for her face shape. Like Kate, when Meghan wears her hair loose, she opts for a blow-dried style with loose curls, but her curls tend to be worn in a way that is looser and more relaxed than Kate. Her LA upbringing means that Meghan has a more laid-back and low-key style to wearing her hair. This is particularly reflected in the updos that she chooses: Meghan often opts for an undone messy bun. To achieve this look, you pull your hair back loosely into a ponytail and secure it at the nape of your neck: then wind the length of the hair around itself, securing with bobby pins until it forms a loose bun. Don’t worry too much if any hairs fall out of the style: that will only add to its disheveled charm. To finish the look, pull some strands of hair out of the updo and leave them laying long and loose around your face to frame it. This is the quintessential Meghan Markle style, and perfect for both formal and casual occasions. No matter which princesses style suits you best when you choose either Kate Middleton or Meghan Markle for your latest hair inspiration you’re sure to achieve a look that is both chic and stylish.